Ryanair CEO Michael O’Leary has been shouting for a long time about the harsh consequences for the low-cost carrier if there is no deal between the EU and the UK on air traffic rights. Alexander de Juniac, director general of the International Air Traffic Association, representing 300 airlines worldwide, recently joined O’Leary in his concerns and raised a red warning flag on the chaotic situation airlines and passengers are heading towards if no deal is reached within a very short time between the two sides that includes air traffic rights. Bookings for summer 2019 are about to start as the airlines are announcing their traffic programs for next summer. It is only six months to March 29, but consumers are mainly confident that everything will go as planned and ticket sales are not being hit, according to reports from the airlines. So far so good, if a Brexit deal is agreed and air traffic rights between the UK and EU remains as today. 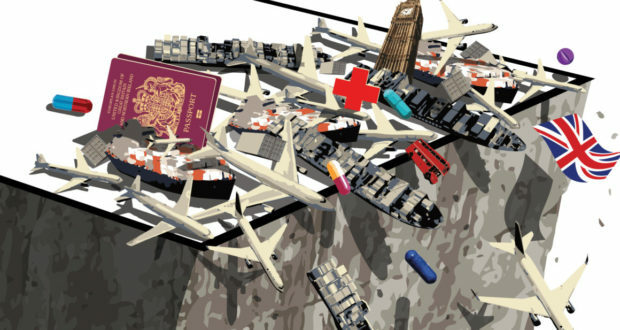 But if no deal is in place by then and no transition period where it’s UK/EU business as usual from March 30 to December 31, doom can hit airlines with high-volume traffic from the UK to EU countries. – Loss of traffic rights between UK and EU countries, defined as the European Common Aviation Area (ECAA). This can shut down scheduled flights and charters between the UK and all EU countries. – Loss of traffic rights between the UK and countries that today have a bilateral air traffic agreement with the EU, meaning the USA and 170 other countries outside the EU. The UK government has been renegotiating several new agreements already, but there is still a lot of work remaining, though a UK-USA Open Skies agreement is likely to be ratified soon. – Airline ownership and control conditions, a non-EU airline with an AOC (Air Operating Certificate) within the EU can only be owned/controlled up to 49% by non-EU companies/individuals. Non-compliance can ban airlines from flying in EU airspace. – The UK can be exempt from being a member of the European Aviation Safety Agency (EASA), resulting in non-compliance of pilot licenses issued in the UK, meaning such licenses will not be valid in EU airspace. It will also result in non-compliance of aircraft parts manufactured in the UK for use on aircrafts produced in the EU, i.e., Airbus. The total impact of a hard Brexit/no-deal situation is at present difficult to foresee, but there is a fair possibility that flights between the UK and the EU can be discontinued and create a severe situation in a short-term perspective from March 30. The financial impact on airlines with weak balance sheets and low liquidity can be hard to overcome, but it is likely such airlines will rapidly reallocate capacity to other markets and already have established contingency plans. Airlines with solid balance sheets and strong liquidity will be able to manage over time, but these airlines will also redeploy capacity and employees to other markets outside the UK if no imminent agreement is in place when the UK leaves the EU. There are no preferred or prioritized industries in the Brexit negotiations between two sides and airline and air traffic rights are negotiated at the same level as all the other industry sectors. In a worst-case situation where air traffic services between the UK and the EU come more or less to a standstill on and after March 30, it is likely that some sort of agreement will surface due to the severe impact, but the airline industry does not have fallback options like the World Trade Organization and most other industries do, making it even more complicated for the airlines to get support for a temporary deal to resolve the issues in the short-medium term. The present status on the Brexit negotiations is at a level most certainly trigging nightmares for airline CEOs. One thing is for sure, however. The airline industry, recognized as the world’s most competitive business sector, adapts fast to new challenges and competitive landscape changes and will overcome a hard Brexit, but hardly without any casualties, as predators will emerge and escalate the consolidation of airlines in Europe.